Almost all motorcycle riders complete formal training before operating their vehicle on the road. Completing a training course provides theoretical and practical knowledge of how to safely operate a motorbike. Driving lessons will provide riders with basic rules and skills. Formal training often includes a range of learning methods, including in-class theory instruction, as well as on-site and on-road practical lessons. Driving lessons offers the best way to learn and gain hands-on experience in a safe learning environment. It also ensures riders will have the knowledge and skills needed to successfully pass theory and practical tests when obtaining a full motorbike licence. There are three types of motorbike driving licences. A Category A1 licence allows drivers to operate a motorbike with an engine size of up to 125 cc. Motorbikes must also have a power output of no more than 11 kW and a power to weight ratio of 0.1 kW/kg or less. A Category A2 licence permits drivers to drive a motorbike featuring a power output of up to 35 kW and a power to weight ratio of no more than 0.2 kW/kg. Category A2 driving licences allow motorbike operators to drive vehicles with power outputs of over 35 kW or a power to weight ratio of 0.2 kW/kg and over. To apply for an A1 or A2 licence, drivers must be at least 17 years old. For an A licence, operators must be at least 21 if the applicant held A1 and A2 licences. To obtain a Category A licence under a direct access scheme, drivers must be at least 24. Motorbike riders must pass a motorcycle theory test to obtain a full licence regardless of the category, in addition to a practical test with a motorbike. A provisional licence can be sought in order to operate a motorbike on a public road. Provisional licences allow drivers to gain on-road experience in advance of obtaining a full motorcycle licence. In order to hold a provisional motorcycle licence, drivers must complete an approved Compulsory Basic Training (CBT) course. 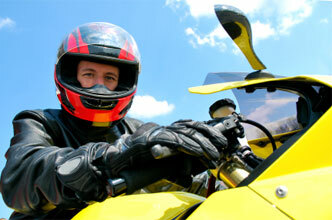 Completing a CBT course is not required if a motorbike operator obtained a full car licence before February 2011. Completing a course is also not mandatory when driving a 50 cc moped. When completing training, riders can use their own motorbike or a vehicle provided by the driving school. Theory and practical tests are completed throughout the duration of the course to test progress, knowledge and skills. Riders are provided with a certificate verifying that they successfully completed the CBT course. Once the course has been satisfactorily completed, drivers can ride a motorbike with an engine size of up to 125 cc and a power output of up to 11 kW. Motorcycles can be operated on any public road with a provisional licence, so long as the driver uses L plates on their vehicle. In Wales, motorcycle riders must use either D plates, L plates or both plates when riding with a provisional licence. Motorbikes with engine sizes of over 125 cc can be ridden on direct access roads with a provisional licence. Compulsory Basic Training (CBT) courses for motorbike drivers are available in driving schools across the country. The CBT includes a number of elements. The first part of the training course is an introduction to motorbike riding, including information on theory with respect to safety and rules of the road. Once a rider is familiar with the rules of the road and how to operate a motorcycle, they complete practical on-site and on-road riding with a driving instructor and other students. On-site motorbike training is typically completed on a track or course. On-site training provides a safe environment without regular traffic to gain hands-on experience in a range of skills, including proper cornering, passing and braking. On-site practical training is followed by on-road training where students operate a motorbike on a public road with other road users. Practical training is essential in order to not only gain experience, but also become comfortable with operating a motorbike on roads with other vehicles. The cost of completing training courses often depends on the course provider, such as a driving school. It is important to shop around for courses in order to obtain the best price and value for money. Looking at reviews and talking to riders who have completed the course will also provide insight on whether the training is appropriate and useful. When signing up for a course, make sure that it is offered by a approved training body.